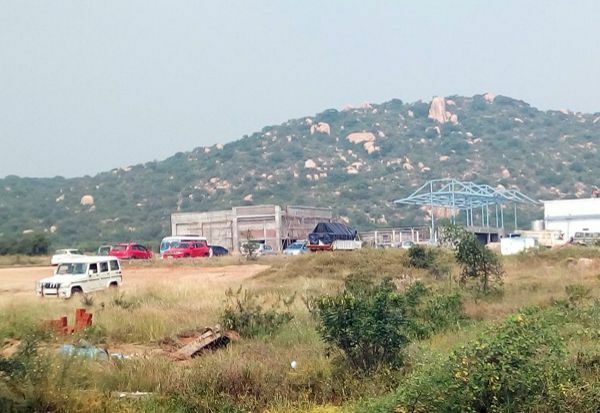 For a change, Tamil Nadu Hindu Religious and Charitable Endowments Board (HRCE) is trying to save the land that belongs to a temple in Tiruppur unlike its usual self of usurping temple properties. Utthanda Velayutha Swami temple in Uthiyur owns nearly 1200 acre land, out of which around 100 acres worth ₹200 crore has been illegally acquired by a private dairy company, Hatsun Agro products. Some local news reports based on devotees’ knowledge allege that these lands were being tilled on lease by the local population until a few years ago and that some of them fraudulently obtained documents to sell the land. In January 2017, the company began construction of a dairy processing unit in the disputed land. After initial complaints by local devotees and Hindu Munnani, that the land belongs to the temple and that the construction is illegal, in November 2017, HRCE officials inspected the place, stopped the construction work and declared it to be the property of the temple. A board was placed on the land warning that it belongs to the temple and no further construction activities should take place. The board was smashed by the company workers the next day itself and the work continued. As a result of Hindu Munnani’s protest, the work was stopped and a HRCE watchman was appointed to guard the land. All through this, the private firm’s watchmen also were guarding the place. As per the Assistant commissioner of HRCE, in February 2018, the sub collector announced that the land doesn’t belong to the temple. Challenging this order, HRCE filed a writ petition in the High Court. The HC cancelled the sub collector’s order and the company filed an appeal against it. That appeal was also dismissed by the court in June 2018. Still, the company resumed construction works in December 2018 with police protection. When asked, the police and Tehsildar said that the company has obtained permission from the sub collector to resume works. So the HRCE Assistant commissioner said the company is acting against court orders and promised action against them. Once again, Hindu Munnani came to the rescue and gheraoed the site. They questioned as to how construction activities can be allowed, workers be permitted to enter and police protection given while there is a stay order on it. Tehsildar who came to negotiate said that permission was given based on the sub collector’s order in February and was snubbed by the Hindu Munnani leader when he cited the court’s order cancelling it. Even as the devotees and Hindu Munnani protested against the illegal construction work, farmers of the surrounding villages or politically motivated people, as alleged by the devotees and Hindu Munnani, launched counter-protests supporting the construction. Devotees also alleged that the involvement of a politician from the ruling party made the concerned officials hesitate to take necessary action. When Hindu Munnani cadres took oath in the temple to protect the land, DMK and ADMK party cadres supposedly created ruckus against them in the garb of farmers who support the dairy firm. On the other hand, some farmers from the surrounding villages besieged the sub collector’s office alleging that those who protest against the construction of dairy processing unit are willfully obstructing the growth of the region as the land sold to the company belonged to the farmers, not the temple. They also claimed that the dairy processing unit would give employment to 3000 locals and that 5000 farmers’ families will be affected if the project is stopped. Hindu Munnani is still objecting to government agencies and officials’ apathy towards reclaiming the temple property and recently staged a dharna in the city gathering a 3000 strong crowd to register its protest demanding that the corrupt officials in the land registration department who facilitated this be brought to book. BJP national executive member CP Radhakrishnan also took part in the protest.